Pies were enjoyed long before America even existed, dating back as far as the Middle Ages. Most of those pies however didn't even contain any sugar....YUCK! Apple pie didn't become a patriotic symbol for America until sometime during WWII, when American soldiers coined the phrase "Fighting for Mom and Apple Pie". The Apple Pie reached it's popularity peek as an American icon around 1970, thanks in large part to a commerical jingle and apple companies' slogans to try and popularize the fruit. 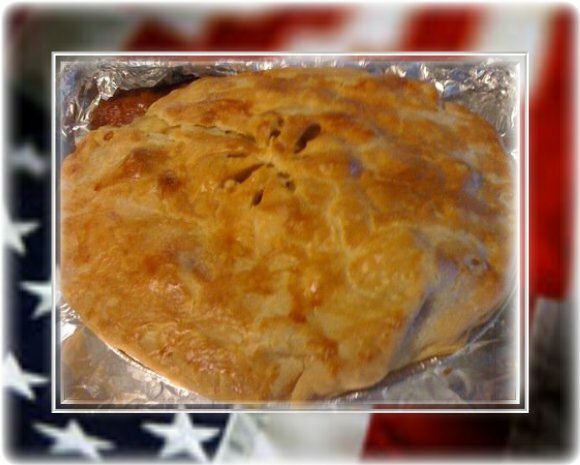 Thus....'As American As Apple Pie' was born!!! 2. Place the bottom crust in your pan. Fill with apples, mounded slightly. Gently pour the sugar and butter liquid over the crust. Pour slowly so that it does not run off. Add in Caramel. Place top Crust over gently pinching the sides together. Slice a couple holes in the top crust. To add a richer color to a double-crust brush the top crust with milk or lightly beaten egg before baking. Place Pie on cookie sheet to prevent spill overs in your oven. 3. Bake 15 minutes in the preheated oven. Reduce the temperature to 350 degrees F (175 degrees C). Continue baking for 35 to 45 minutes, until apples are soft. You may need to put tin foil around the edges of the pie to keep them from becoming to dark or burning.